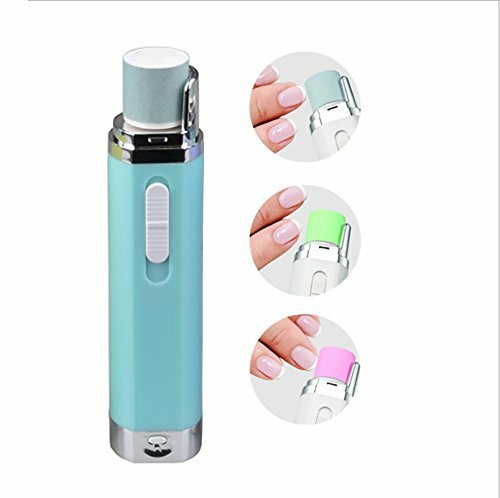 ✔ Electronic Nail Buffer and Polisher,Perfect Nail Care System for smoothing corns and calluses, removing excess cuticles, and filing, shaping and buffing nails. ✔ High-quality: Noiseless,Using ergonomic design, stylish, feel good,Manicure compact device, you save time and effort, relaxed to achieve your beautiful. ✔ Safe and Convenient ,Enjoy a clear, natural looking nails without any chemicals nor mess.Elegant appearance, easy to carry. ✔ Mult function: Equipped buffing and shining nails. Effectively smooth corns and calluses, remove excess cuticles, and file, shape buff shine the nails.Built-in UV dryer accelerates nail polish drying time. No more waving your hands around in the air! Everything you need to keep your nails in shape. Great Tool For Keeping Your Nails Nice, Naturally Shiny & Manicured!